Crystalline materials known as perovskites could become the next superstars of solar cells. Over the past few years, researchers have demonstrated that a special class of perovskites—those consisting of a hybrid of organic and inorganic components—convert sunlight into electricity with an efficiency above 20 percent and are easier to fabricate and more impervious to defects than the standard solar cell made of crystalline silicon. As fabricated today, however, these organic/inorganic perovskites (OIPs) deteriorate well before the typical 30-year lifetime for silicon cells, which prevents their widespread use in harnessing solar power. Now a team led by Andrea Centrone at the National Institute of Standards and Technology (NIST) and Jinsong Huang and Alexei Gruverman of the University of Nebraska has found the first solid evidence for a property of OIPs that may provide a new way to improve their long-term stability as solar cells. The unexpected feature that the team found is known as ferroelasticity—a spontaneous rearrangement of the internal structure of OIPs in which each crystal subdivides into a series of tiny regions, or domains, that have the same atomic arrangement but which are oriented in different directions. This rearrangement creates a spontaneous strain in each domain that exists even in the absence of any external stress (force). "The role of the ferroelastic domains on the material stability must be understood," said Centrone. At high temperatures, OIP crystals do not subdivide and have the same cubic arrangement of atoms throughout. At room temperature, however, the OIP crystal structure changes from cubic to tetragonal, in which one axis of the cube elongates. That's where the ferroelastic property of the material comes into play. "To transform from a cubic to a tetragonal arrangement, one axis of the cube must elongate. In the process, each crystal subdivides into smaller domains in which the elongated axis can point in a different direction, leading to spontaneous internal strain," explained team member Evgheni Strelcov of NIST and the University of Maryland. 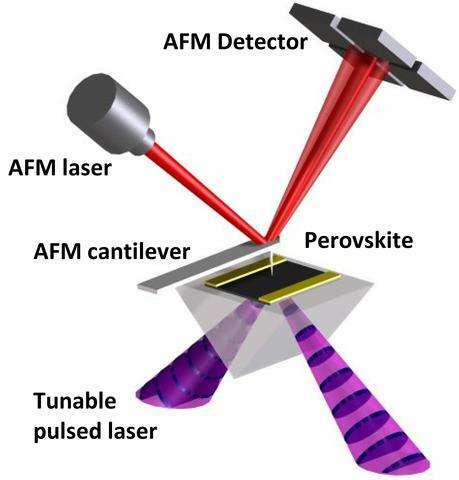 At present, it remains unknown whether ferroelasticity is a property that improves or hinders the performance and stability of perovskite solar cells, noted Centrone. But the very fact that OIPs have this internal structure, breaking up single crystals into domains, is important to investigate, he added. Boundaries between crystals—so-called inter-grain boundaries—are known to be weak points, where structural defects concentrate. Similarly, the boundaries between the newly discovered ferroelastic domains inside a single crystal—intra-grain boundaries—might also affect the stability of OIPs and their performance as solar cells. The researchers discovered that by bending the crystals, they could reliably move, create or eliminate the ferroelastic grain boundaries—the borders between subdivided crystal regions having different orientations—thus enlarging or reducing the size of each domain. The bending also changed the relative fraction of domains pointing in different orientations. The researchers recently described their work in Science Advances. In their study, the team found no evidence that the OIPs were ferroelectric; in other words, that they formed domains where the separation of the center of positive and negative electric charges is aligned in different directions in the absence of an external electric field. This finding is significant, because some researchers had speculated that ferroelectricity might be the underlying property that makes OIPs promising candidates for solar cells. The researchers created single whole crystals large enough to reveal ferroelastic domains, which appeared as striations with an optical microscope. They also studied OIPs consisting of polycrystalline thin films, which were examined using nanoscale techniques. The researchers used two nanoscale methods employing atomic force microscope (AFM) probes to measure ferroelasticity in OIP thin films. At the University of Nebraska, Gruverman and his collaborators used piezoresponse force microscopy (PFM), which mapped the electrically induced mechanical response of an OIP sample in repose and under mechanical stress by gently bending the sample. In the other method, laser pulses spanning from the visible to the infrared ranges struck a perovskite thin film, causing the material to heat up and expand. The tiny expansion was captured and amplified by the AFM probe using photothermal induced resonance (PTIR), a technique that combines the resolution of an AFM with the precise compositional information provided by infrared spectroscopy. PTIR imaging revealed the presence of microscopic striations that persisted even when the samples were subjected to heating or applied voltage. Experiments showed that the striations were not correlated with the local chemical composition or optical properties, but were due to differences in thermal expansion coefficient of the ferroelastic domains.